Ever thought of writing an RPG and couldn't find a boot up the rump to get you started? Ever wondered what £30 of Amazon Vouchers could buy you? Ever wondered what it would be like playing an RPG that was set in a really small space? Ever wondered what sleep deprivation felt like? Ever wondered what Rob says to his dearly beloved whenever £30 disappears from his account each year? Ever wondered? Well, we're at it again! 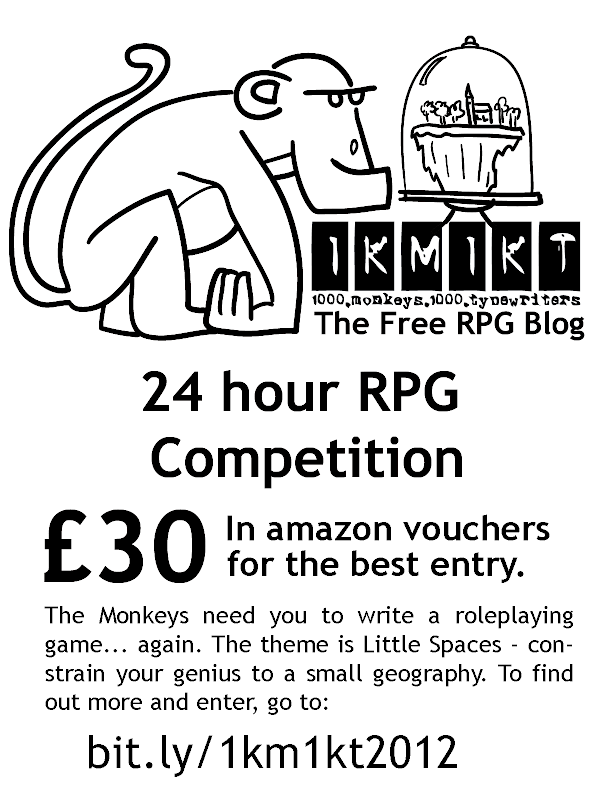 The Monkeys over at 1KM1KT (the première Free RPG community; you do know about 1KM1KT, don't you? Good... I'll continue...) have decided that a year is enough time for you all to have recovered from the brain bending exploits of the Movie Mashup Competition and get stuck into another 24 Hour challenge. Write an RPG in 24 hours. How hard can it be? This year's theme is Little Spaces. We have thought long and hard and come up with a number of small geographies for you to set a game. Blend setting and system in 24 hours to give us that snug, cramped, claustrophobic feel of a packed in place to play. Fear falling from the Dirigible or cause mayhem in a Research lab, there is plenty of choice in the list. There are some other rules too and except writing it in 24 hours, they're all pretty easy. This year there isn't any need to shave yourself. There's no entry fee and if you're in your 30s with a family then you can blame being locked in a dark room for 24 hours on a mid-life crisis. They'll be thankful you emerged with a shiny new roleplaying game of brilliance and not wearing pink war paint and Hello Kitty lingerie. OK, hate to be 'that guy' but I am confused. Did you look at the list? Little Spaces? A 1-mile Ringworld? An Underwater City? A City?? An infinite waterfull? INFINITE?!? Am I misunderstanding the meaning of the term 'Little'? A 1 mile Ringworld isn't really large at all. You can't fit much world in a mile. An underwater city doesn't have to be a bustling metropolis - it could be more of a claustrophobic Rapture. And in an infinite waterfall, where everything is falling, a small village could exist. Little spaces is really a contrast to the enormous worlds of Middle Earth, the Traveller universe, Forgotten Realms or huge dungeon complexes of many levels. Bonus marks for making it really small and still varied and interesting! So we can use any 24h until the deadline? And it's basically rules+setting+intro adventure, right? Hi Nils, the 24 hours must be contigous (without a break). If you start at 8pm one day, then you have until 8pm the next day! This probably isn't the right place to put this, but... How would I contact Rob Lang directly? I'm going to post a large free-rpg related file I think a lot of people will be interested in, and I'd like it if he'd announce it on the blog. As long as I'm here, though, cool idea. Like the 24 hour theme- probably produce some settings more in keeping with what someone can actually flesh out in 24 hours. Thanks for your comment. It's weird that I don't have my email in the footer, so I've added it. I can't promise announcements but I will give feedback. Thanks. I don't ask for promises, but I thin you'll like this.